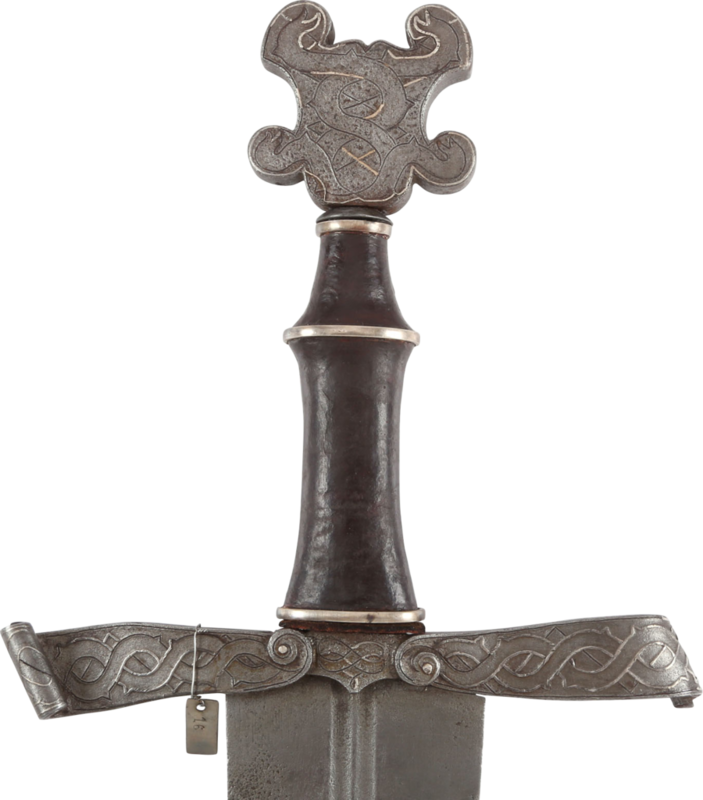 This rare sword is from a small but well known group, best represented by the work of Italian (Ferrara) goldsmith Ercole dei Fedeli, four examples of which are illustrated in Armi Bianche Italiane, #293-298. All are dated 1505-10. They currently reside in museums in Paris, Vienna and Leningrad. Two are identified as from the Knights of Saint Peter and were given by Pope Julius to Maximillian I. As with the others, this example mounts a wide blade, 24” in length. It is narrow double fullered, of pattern welded steel struck with a maker’s mark, a serpent, each side, at the forte. The iron hilt is of the form which distinguishes the group. The cross guard is two elegant ribbon form elements, tapered in section from top to bottom, with fine scrolling terminals, flanking the quillon block. The junction is defined by spirals on the front and a simpler rounded end on the back, an exceeding rare feature, as cruciform swords are invariable indistinguishable, one side from the other. The pommel is of the four lobed form specific to the group. The guard and pommel are inlaid in silver, now mostly lost, in curvilinear and helix designs. These designs and the flowing form of the guard are precursors of Mannerism art which infused movement, flow and drama into art. The forms seen here are not transitional as would be expected, but revolutionary, practically reinventing the sword hilt considering the context. That the Pope would present two to Maximillian attests to the esteem in which they were held who surely recognized their seminal place in the Mannerist movement. An exceedingly rare late Gothic sword.